Friday, September 25 1908 -- Two young lightweights, Leonard Lauder and Harry 'Kid' Trendall, are set for a rematch tonight in L.A., after a bout last month that ended in a draw. Trendall was well-known as the better fighter, and had a long career ahead of him, but Herriman here throws a bone to the underdog Lauder. Lauder's career would be less than stellar, his stats show that he was mostly a punching bag earning losses and draws in most of his fights. Trendall would take away the win on points in this rematch. Connie, October 30 1938, courtesy of Cole Johnson. Wyncie King was born in Covington, Georgia, on September 21, 1884, according to Who Was Who in America with World Notables (1981). His parents were George Whitfield and Susie Davis (Brown) King. In the 1900 U.S. Federal Census, King, his parents and older brother, George Jr., lived in Paris, Tennessee. His father was a stock broker, and brother a drugstore salesman. Nashville, Tennessee city directories, at Ancestry.com, listed King as a clerk at “S W & I Bureau, b 1524 Division” in 1905. The 1906 directory said King was a cartoonist and had the same address. Who Was Who said King was at the Nashville Banner and Nashville Daily News in 1905. …at age 19, he signed on as a weighmaster for the Louisville and Nashville Railroad. While waiting for the next train, King would often fill his spare time drawing sketches and caricatures of his coworkers. Confident that his likenesses were better than those featured in the local paper at the time, King took several of his drawings to the editor of the Nashville Banner who promptly bought them and requested more. Before long, he was on staff at the Banner where he stayed until accepting a position at the Courier-Journal around 1910. King moved to Louisville around 1906. The 1907 Nashville directory said King “moved to Louisville, Ky.” The listing in the 1907 Louisville city directory said “cartoonist C-J” boarding at “733 4th”. It’s not known if King lived in New York City, but, according to American Newspaper Comics, he sold his strip, He Has a Good Friend in Johnny Queerim, to the New York World which ran it from January 31 to March 17, 1908. In December 1908, Chicago Record-Herald cartoonist King and photographer Lyman Atwell were assaulted by Alderman John Coughlin. It’s not known how long King stayed in Chicago. Louisville city directories, for the years 1914 through 1919, said King resided at the YMCA. On September 12, 1918, King signed his World War I draft card. He was an artist with the Louisville Herald, and named his mother as his nearest relative. King’s description was medium height and slender build with blue eyes and black hair. Who Was Who said King married Hortense Flexner, on April 30, 1919, who was an editor at the Herald. An exhibit of sixty “quasi-caricatures” by Wyncie King, one of the best known caricaturists in America, is being shown at the Morristown (N. Y.) Library for two weeks. The drawings include sketches of prominent Americans in various fields and physiognomic types. It is planned to hang the exhibit in New York at the close of the Morristown engagement. Press notices from other cities where the drawings have been shown describe Mr. King’s work as a departure from the art of caricature as it is commonly practiced, in that the eccentricities of the subjects are treated with a restrained emphasis that stops short of grotesque distortion. Included in the exhibit are sketches of some of the more prominent of the striking actors, a number of political celebrities and members of the foreign military mission sent to this country during the war. One group of “types” that has elicited considerable comment consists of drawings of members of the Legislature of a State visited recently by Mr. King for the purpose of getting these studies. The Kings’ address in the 1920 census was 418 Fountain Court, Louisville. King’s widow mother passed away January 15, 1921. King’s advertising work was written up in the Boot and Shoe Recorder, August 13, 1921, and The American Hatter, September 1921. King and Hortense were mentioned in the October 1921 issue of The Bookman. According to Huffman, King landed a job at the Philadelphia Public Ledger in 1921. 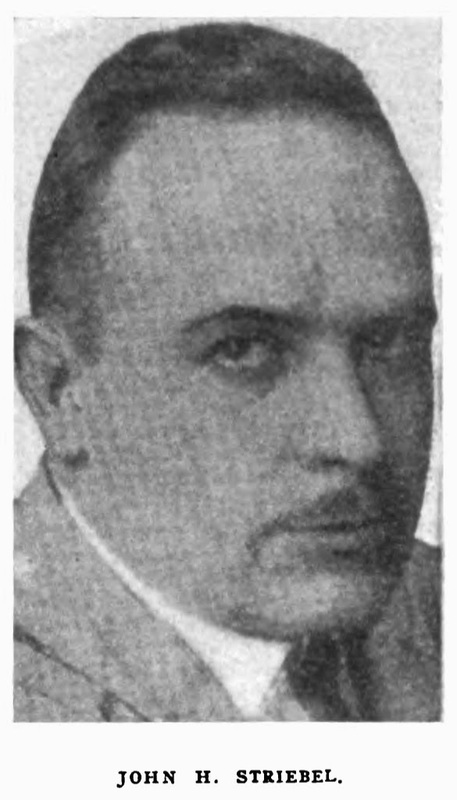 In 1925, King was a regular contributor to the Saturday Evening Post. Hortense was a writer for Curtis Publishing from 1923 to 1929. She taught at Bryn Mawr and later, at Sarah Lawrence College. The Kings made annual trips to Europe from 1926 to 1929. Their address on the passenger lists was College Inn, Bryn Mawr, Pennsylvania. King traveled alone in 1930. King has not yet been found in the 1930 and 1940 censuses. The Jersey Journal (Jersey City, New Jersey), May 4, 1961, reported his death. New York—Wyncie King, 77, illustrator and caricaturist for many leading news papers and magazines, died Tuesday of a heart attack in Athens, Greece, where he was visiting. Mr. King was born in Covington, Ga., but spent most of his early years in Louisville, Ky. He began his career in 1905 as a cartoonist for The Nashville Banner and Nashville Daily News. Until 1910 he was also an editorial cartoonist and caricaturist for The Louisville Courier-Journal and contributed to the old Chicago Record-Herald and the old New York Evening World. 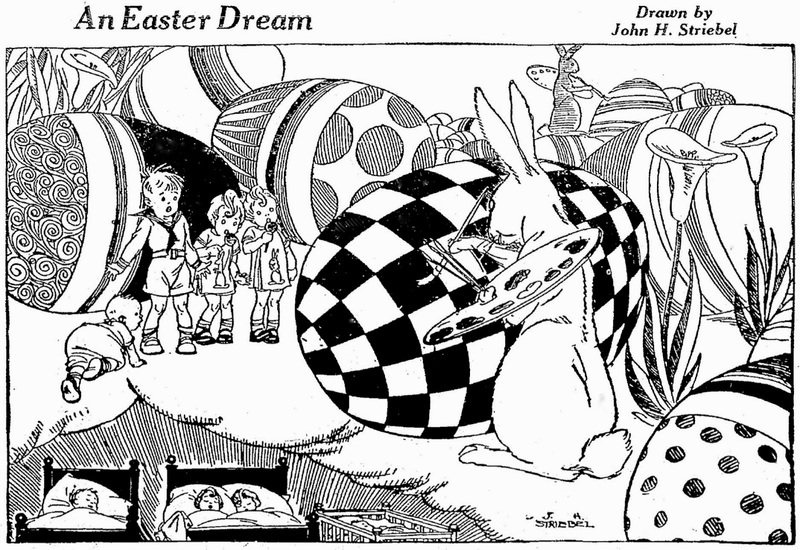 From 1911 to 1921, Mr. King did cartoons, caricatures and feature drawings for The Louisville Herald. 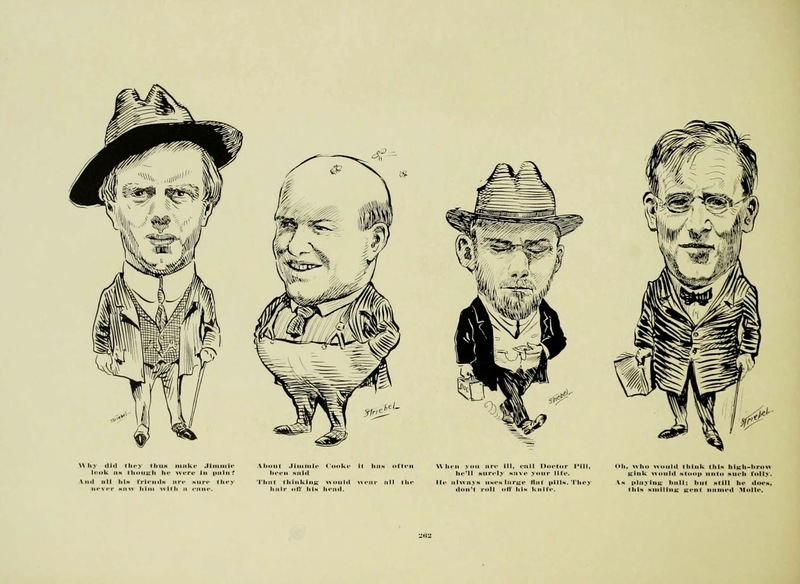 In 1921–22 his caricatures also were seen on the editorial page of The Philadelphia Ledger. The next year his work began appearing in The New York Times Book Review and the old Life and Judge magazines. he became illustrator for The Saturday Evening Post in 1925 at the invitation of the late Cyrus Curtis, the publisher. 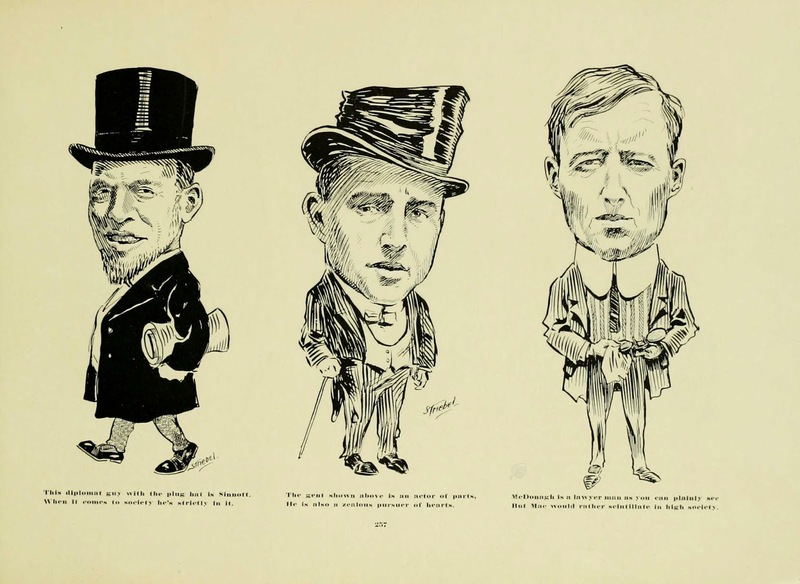 Mr. King’s illustrations for The Post included those for article by Will Rogers. 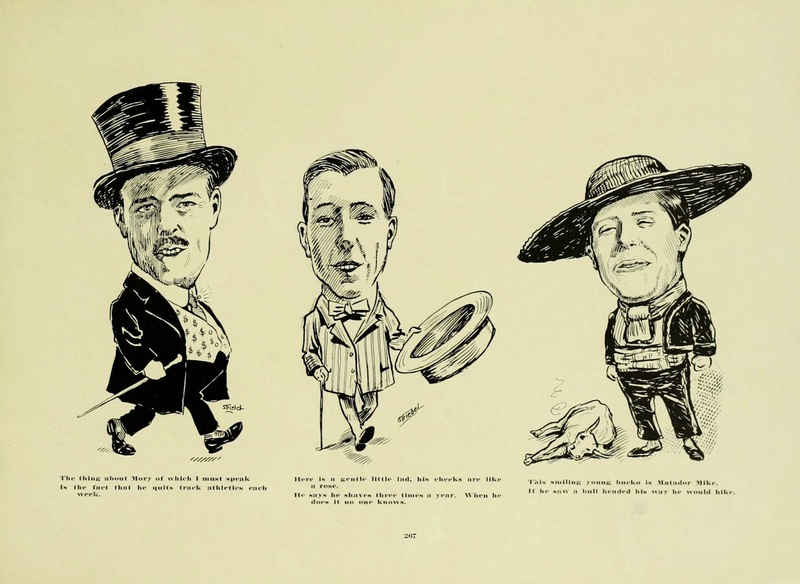 Mr. King was well-known in Philadelphia art circles and his caricatures, many of them in water-color, of members of the Franklin Inn Club of that city still hang on the club’s walls. His work also is in the art collections of the Philadelphia Public Library, the Bryn Mawr College Library and the Filson Club of Louisville. He had exhibited at the Art Institute of Chicago, the Pennsylvania Academy of Fine Arts and the Louisville Art Association. Though his eyesight was failing in recent years, Mr. King did illustrations for children’s books written by his wife, Hortense Flexner King. They included “Chipper,” in 1941; “Wising Window,” in 1942, and “Puzzle Pond,” in 1948. The Review Press-Reporter (Bronxville, New York), May 11, 1961, said King was “a former resident of the Croyden Apartments at 35 Parkview Ave., Bronxville…”, and was survived by his wife and brother, George, of Louisville. King’s remains were buried at Sutton Island Cemetery. 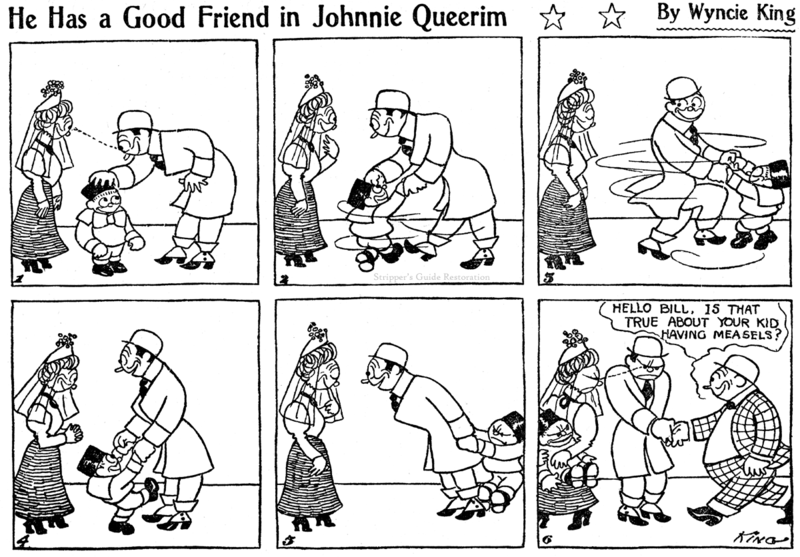 With an eye-catching title like He Has a Good Friend in Johnnie Queerim, you've got to be just a tiny bit disappointed when you realize that this strip is just about some schmuck named Bill, who gets inadvertently ratted out by his buddy Johnnie Queerim every time he's got some little scheme cooking. Did we really expect this 1908 series to be about a committed non-traditional relationship between our two stars? Okay, no, not really. In fact according to an etymological dictionary, the use of 'queer' in that sense was first recorded not until 1922, so the cartoonist probably wasn't even expecting readers to do a double-take on that title. Wyncie King, the cartoonist of today's obscurity, penned the strip for the New York Evening World from January 31 to March 17 1908, with a total of only five episodes printed in that interval. Though Mr. King had a long cartooning career, much of it at Louisville papers, this is as far as I know his only newspaper comic strip series. I always thought Mutt and Jeff were more than friends! "Queer" is also a verb meaning to sabotage, as in "Don't queer the deal"--hence its use here. John H. Striebel was born Floyd Henry Striebel in Bertrand, Michigan, on September 14, 1891. His birth name was found in the Bulletin of the University of Notre Dame: General Catalogue 1910–1911, passenger lists and newspapers. His birthplace was named on passenger lists and his obituary in the Kingston Daily Freeman (New York). The birth date is from the Social Security Death Index, and passenger lists. However, his World War I draft card had the year as 1892. In the 1900 U.S. Federal Census, Floyd Striebel was the oldest of two children born to Henry, a grocery clerk, and Helen. They resided in Portage, Indiana at 556 Burroughs Street. Also in the household were Striebel’s maternal grandparents and two aunts. How Floyd Striebel, ‘Newsy,’ Suddenly Became a Cartoonist. From Human Life.When Charles Kane, who is now sporting editor of the Chicago Examiner, was doing a column of humor a day on the South Bend, Ind. Morning News, one day he chanced to go down to the pressroom and he saw a newsboy drawing a cartoon of the circulator on the newly whitewashed basement walls. Kane took the youngster by the ear upstairs and into the office of the managing editor. “I won’t do it again, honest…,” protested the frightened lad. This rather unconventional introduction of Floyd Striebel to the editor of the South Bend News had two results: the News circulator lost a newsboy, and young Striebel was engaged to draw a page cartoon every day. This was in December 1908, when Striebel was just 16 years of age. The work that the boy has done since that engagement is of a nature to mark him as one of America’s coming cartoonists. A newspaper cartoonist must have ability in two lines: he must be able to execute an idea; he must be able to get the idea. Young Striebel’s execution is by no means crude, considering that he has had absolutely no artistic schooling. That is what he is now working for, to earn enough money to put himself through the Chicago Art Institute. But he has all of an experienced cartoonist’s grasp of public affairs. He finds no difficulty in conceiving his cartoon ideas. One night when the News was short a reporter, Striebel was sent out to cover an important police story, which he did with the ability of a veteran newspaper man. His versatility makes him valuable. Some of the very best work in the book must be credited to Mr. Floyd Striebel, cartoonist for the South Bend News. That this young man has a remarkable facility for catching expressions is amply evidenced by the caricatures of the Seniors in the back of the book. These pictures, nearly all admirable likenesses, were done with nothing but photographs to work on, and they manifest an unmistakable talent for character-drawing in the artist. Striebel drew 37 caricatures. After Notre Dame, Striebel moved to Chicago, where he worked for “Meyer-Roth, Marshall Field & Co., the Chicago Tribune, Palmolive Soap, and other large purchasers of high-grade art,” according to the Fourth Estate, December 2, 1922. The Indiana, Marriage Collection, at Ancestry.com, said “John H. Striebel” married Margaret Fernandez on June 30, 1915. Striebel signed his World War I draft card on June 5, 1917. He resided at 1966 East 72nd Place in Chicago. The commercial artist said he had two dependents, a wife and child. The description said he was of medium height and build with brown eyes and black hair. Striebel’s address in the 1920 census was 6840 Merrill Avenue, Chicago. He was an advertising illustrator with a daughter and son. Also in the household was his brother-in-law, William Fernandez, an advertising art director. Striebel collaborated with Notre Dame schoolmate, J.P. McEvoy, on his family serial, The Potters, for the Chicago Tribune, which mentioned the serial in its advertisement on the cover of Editor & Publisher, April 30, 1921: “‘The Potters,’ a new weekly humorous satire in verse on married life in a big city”. According to American Newspaper Comics (2012), Striebel collaborated with writer Robert Quillen. Beginning in September 1921, they produced Aunt Het and Willie Willis for Associated Editors. 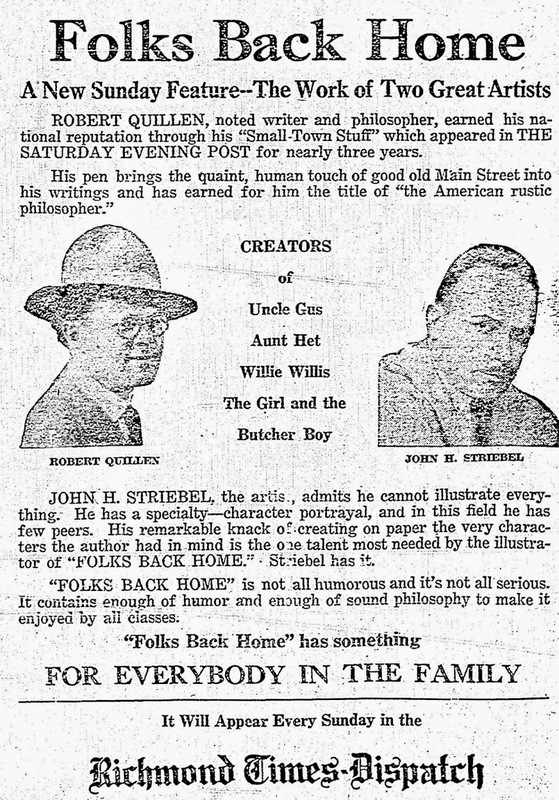 The Fourth Estate, June 17, 1922, reported Striebel’s next project. Pantomime debuted August 7, 1922 and ended June 2, 1925. It was followed by the panel Babies, which ran from as early as August 31, 1925 to November 29, 1930. 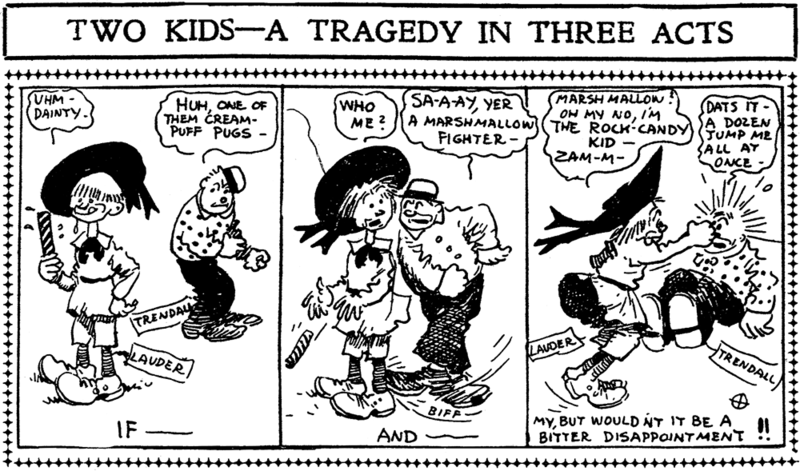 Another strip he may have drawn was Poor Pa which began November 8, 1926. At some point Striebel moved to New York City. His family was listed in the 1925 New York state census at 15 East 9th Street. When Striebel and his wife returned from Europe on September 17, 1926, their address, on the passenger list, was Woodstock, New York. The 1930 census recorded the Striebels in Woodstock on Orchard Place. Striebel’s occupation was commercial artist. Striebel’s second collaboration with McEvoy, a future Woodstock resident, was Dixie Dugan. In Indiana’s Laughmakers (1990), Ray Banta wrote about McEvoy’s Dixie Dugan. …One of his creations, which appeared in Liberty magazine, was a serial about a 25-year-old showgirl named Dixie Dugan. McEvoy expanded the serial into a novel, and from there it went on to become a Ziegfeld musical. Striebel, though still in Chicago, was called upon to illustrate the Liberty magazine serial, which was then titled Showgirl. The original Dixie Dugan was based on silent film star Louise Brooks, but took on a character of her own when McEvoy infused her with the real-life qualities most of the current showgirl strips lacked. The result was renamed Dixie Dugan in 1931 and became one of America’s first “continuity,” or continuous action comic strips. Dixie Dugan was syndicated by the McNaught Syndicate and ran for more than 30 years. The World-Herald (Omaha, Nebraska), October 28, 1929, published a photograph of show girl Wanda Valle who was Striebel’s model for Dixie Dugan. Striebel and McEvoy were profiled in Modern Mechanix, April 1937. 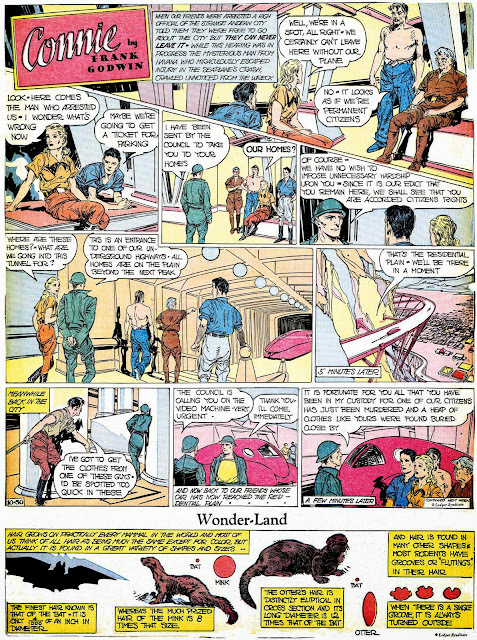 Dixie Dugan and Joe Palooka met in a crossover published from January 4 to 6, 1940. According to the Field Guide to Wild American Pulp Artists, Striebel produced artwork for a number of pulp magazines during the 1930s. He used the pseudonyms “William Streib” and “Stephen Waite”. On August 21, 1934, Striebel married Evelyn Kreighbaunn, according to the Cook County, Illinois Marriage Index at Ancestry.com. The couple was listed in the 1940 census as residents of Woodstock. Striebel’s occupation was illustrator. The Kingston Daily Freeman, June 12, 1943, reported the death of Stirebel’s mother. Mrs. Helen Striebel, wife of Henry W. Striebel of Bearsville and formerly of South Bend. Ind., died in the Benedictine Hospital, Friday. Surviving besides her husband is one son, John H. Striebel of Bearsville, one daughter, Mrs. Bertha C. Robaska of South Bend, three grandchildren and two great-grandchildren. Funeral services and burial will be at South Bend on Tuesday. Striebel was one of ten cartoonists featured in the Life magazine’s February 3, 1947 pictorial, “I Could Draw with My Eyes Shut”. 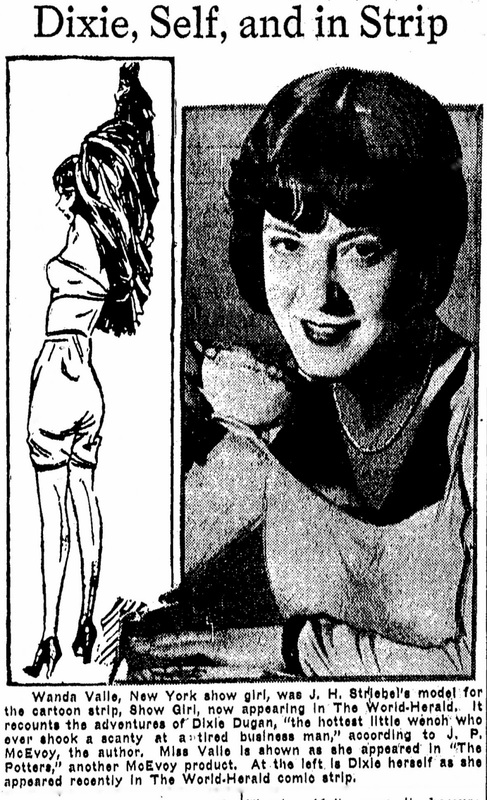 Striebel’s art production process was revealed in the St. Petersburg Times (Florida), November 13, 1950. John Striebel, creator of the comic strip, “Dixie Dugan” syndicated in 300 newspapers, and his family have set up shop in the City of Anna Maria for the Winter. Striebel says he finds the Island a fine place to work, similar to Woodstock, N.Y., his home. The strip is a sort of family affair. Striebel does the art work, his daughter Marjorie Huffine, handles the lettering, and Mrs. Striebel is in charge of Dixie’s fashion department. The script is written in Hollywood by Renny McEvoy, stepson of J.P. McEvoy, Striebel’s original partner. News of the passing of Striebel’s father was printed in the Kingston Daily Freeman, July 21, 1954. Henry W. Striebel, father of John H. Striebel, prominent cartoonist of Bearsville, died in Kingston Tuesday. A native of South Bend, Indiana Mr. Striebel has resided with his son at Bearsville for a year. Besides the son, he leaves a daughter, Mrs. Howard Walter and three grandchildren; two sisters Mrs. Otto Rasp and Mrs. Elmer Bernhard of South Bend. The body was sent to South Bend by the Lasher funeral Home of Woodstock today for services and burial on Friday. Striebel legally change his name, from Floyd H. Striebel to John H. Striebel, according to a legal notice in the Kingston Daily Freeman, October 18, 1958. Striebel passed away May 22, 1962, in Bearsville, New York. The Kingston Daily Freeman published an obituary two days later. John H. Striebel, a long time resident of Woodstock and a well known illustrator and cartoonist died at his home in Bearsville Tuesday afternoon after an illness of several weeks. Mr. Striebel. 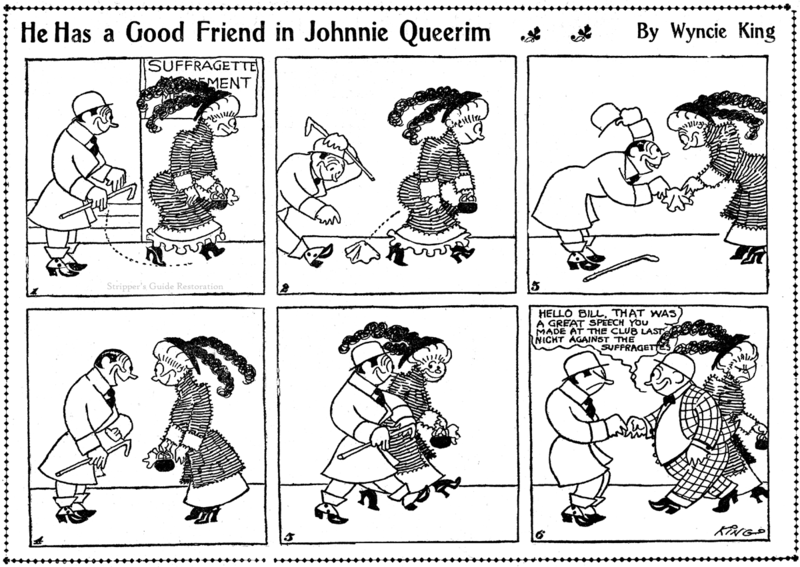 who with the late J. P. McEvoy collaborated on the cartoon strip, “Dixie Dugan,” had lived in Woodstock since 1923. Born in Bertrand, Mich., Sept. 14, 1891, Striebel was the son of Henry W. Striebel and Helen Striebel. Shortly after his birth, the family moved to South Bend, Ind., where he grew up and attended school. At the age of 14 he was a political cartoonist for; the South Bend Daily News, later using the proceeds of his talent to pay his tuition at the University of Notre Dame. Mr. Striebel went to Chicago where he became an advertising illustrator for the Chicago Tribune. His first comic strip. 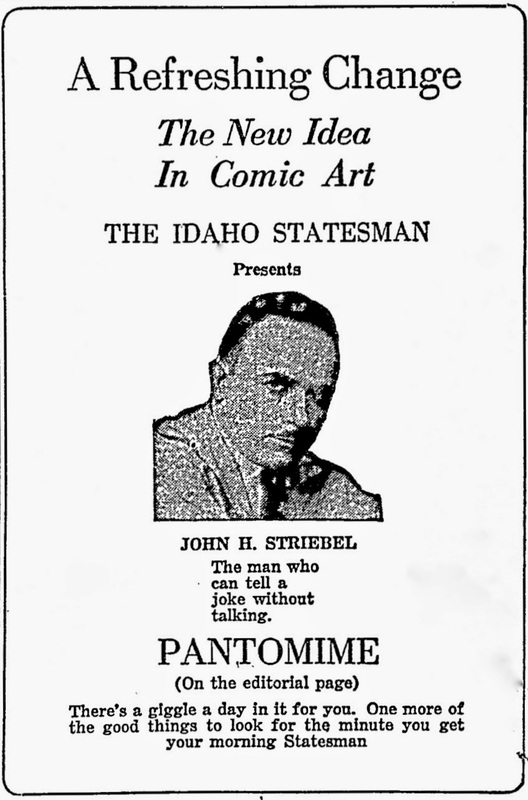 Pantomime, was a feature for eight years, after which Striebel illustrated The Potters, a feature written by J. P. McEvoy who had grown up in South Bend and attended Notre Dame University with Mr. Striebel. After illustrating Show Girl, Striebel came to Woodstock in 1923 to study painting with Henry Lee McFee and Andrew Dasburg. Before Striebel was able to apply himself intensively to the study of painting, he found himself enmeshed in the Dixie Dugan cartoon and soon “Dixie” took precedence over all of his other endeavors which included cover illustrations for Liberty magazine. Mr. Striebel is survived by his wife, Evelyn F. Striebel; a daughter, Mrs. David Hufflne of Woodstock and a son, John H. Striebel Jr. of Westford, Mass. ; a sister, Mrs. Howard Walter of Austin, Tex., and four grandchildren. Funeral services will be held Friday 11 a. m. at the Lasher Funeral Home Inc., Woodstock. The Rev. Arthur E. Oudemool, pastor of Old Dutch Church, this city, will officiate. Cremation will take place at the Gardner Earl Memorial Crematorium, Troy. There will be no calling hours at the funeral home. I love finding your post. John was my great Uncle, brother to my paternal grandmother Bertha Striebel (Mrs. Howard Walter). I was born in 1944 to Forrest Goodenough and Lucia Crocheron Goodenough. Many fond hours of my childhood were spent in Woodstock and the Bearsville home. Uncle John would let me sit beside him as he worked on Dixie Dugan strips. The great Frank King, who later created the enduring classic Gasoline Alley, might not be the sort of fellow you think of as having a zany side. Gasoline Alley, after all, was (and is) an exercise in understated realism, whose characters were only slightly removed from real folks and whose humor was character-driven and quietly gentle. However, Frank King could and did know how to produce zany slapstick material. Check out one of my favorite King strips, Look Out for Motorcycle Mike. The plot was simplicity itself. Mike and his indestructible motorcycle will stop for nobody and nothing (not, not like in Waco last week -- hmm, too soon to joke? ).Mike started by tearing up Chicago, but it wasn't long before he and his trusty iron steed went international, making like American diplomacy all over the world. Look Out for Motorcycle Mike was part of a Chicago Tribune Sunday comics interior page that offered a bunch of strips in small sizes, unlike most every other comic section of the time which printed strips almost universally as full or half pagers. The one-tier Sunday strip ran from September 10 1911 to January 18 1914. It ended shortly before the page was revamped as that amazing experiment, The Crazy Quilt.